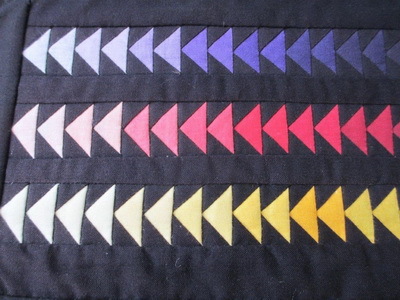 Have you been following our Modern Quilt Welcome block of the month? If you have, you will know that the Flying Geese block was the last block to be added to the quilt. Well that block really gave me an “Attack of the Guilts”. I knew I had a little Flying Geese quilt top sitting in the cupboard somewhere, just waiting to be quilted. It took a little bit of searching but I did eventually find it among the “almost finished” projects. 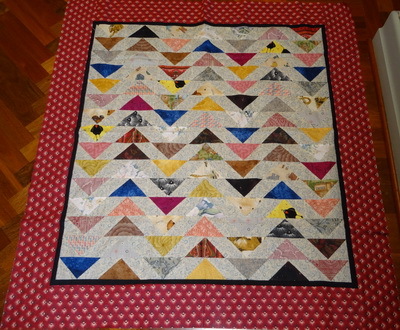 A topsy turvy Flying Geese layout. It was made many years ago, as a shared friendship group activity where we all made a set of blocks for each other, in fabrics and designs of each members choice. So here it is, still not quite finished, but I have now picked out a backing fabric and almost settled on the thread choice for quilting. I am happy with the pink for quilting the border but should I use the light medium or dark blue for quilting the back ground around the “geese”? 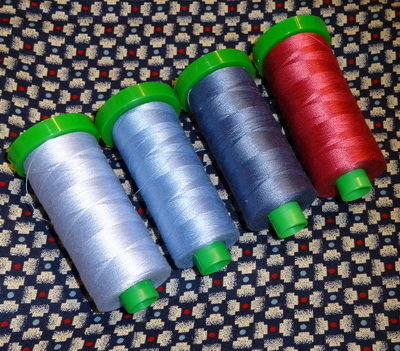 Decisions made, now I just have to quilt! When I showed the quilt top to Ladybirdee she said that the first quilt she ever made was a miniature Flying Geese. This Amish flying geese was made about 20 years ago – when I knew very little about patchwork, and even less about foundation piecing. Colours were shaded, but have dulled over the years. Sometimes when we start our patchwork journey we attempt things that are not beginners work (but we don’t know that) – and some success can follow! You will have read her posts here each month, so you know how successful she has become since stitching her first project. Please tell us about your first quilt project. Is it finished or is it still a work in progress? What did you go on to make after that first project? We love to hear about your projects, so do share a comment with our readers.